I have finished scrap quilt to share today! 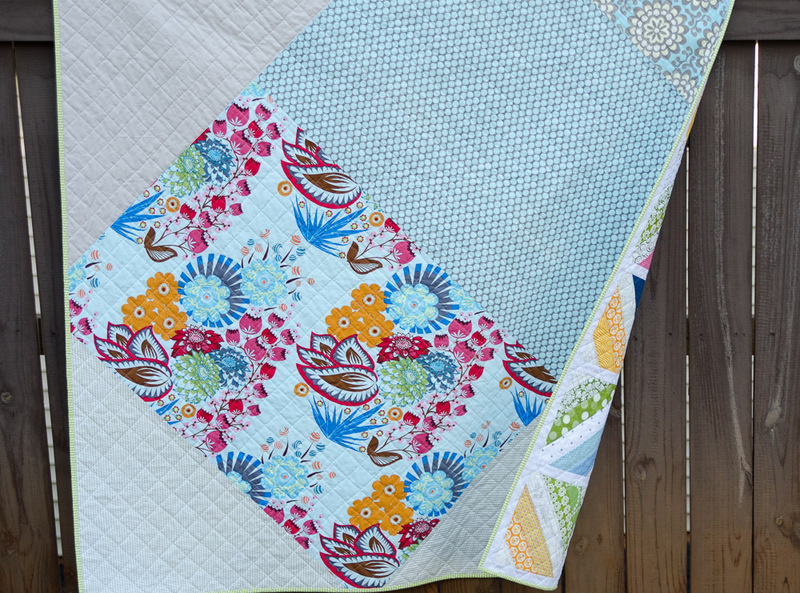 This quilt started with a piece of Anna Maria Horner fabric I've been hoarding for several years. I pulled it out and decided that I just couldn't cut it up. I knew it would be beautiful on the back of a quilt, but I only had a yard to work with. Then I decided to make a quilt inspired by the colors in the print and figure out how I'd make the back when I had to. Once I needed a back, it turned into somewhat of a puzzle to piece it together using fabric in my stash. I taped out an area on the floor that was the size I needed, and just started adding to the inspiration piece. A windy day! 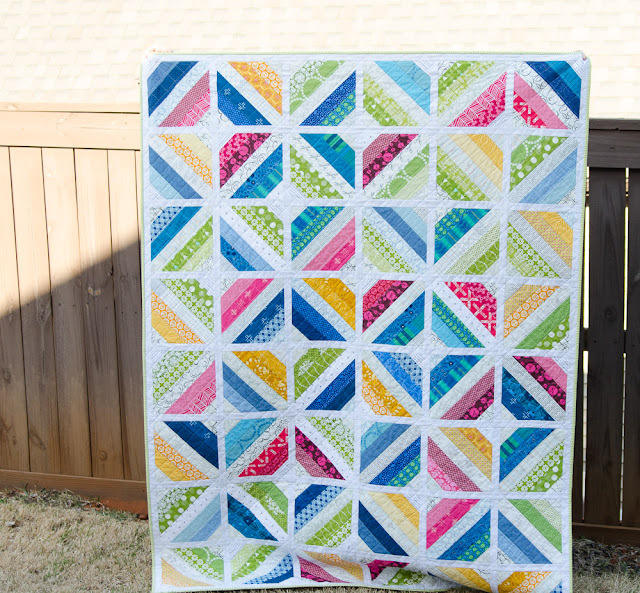 Almost lost the quilt over the fence! 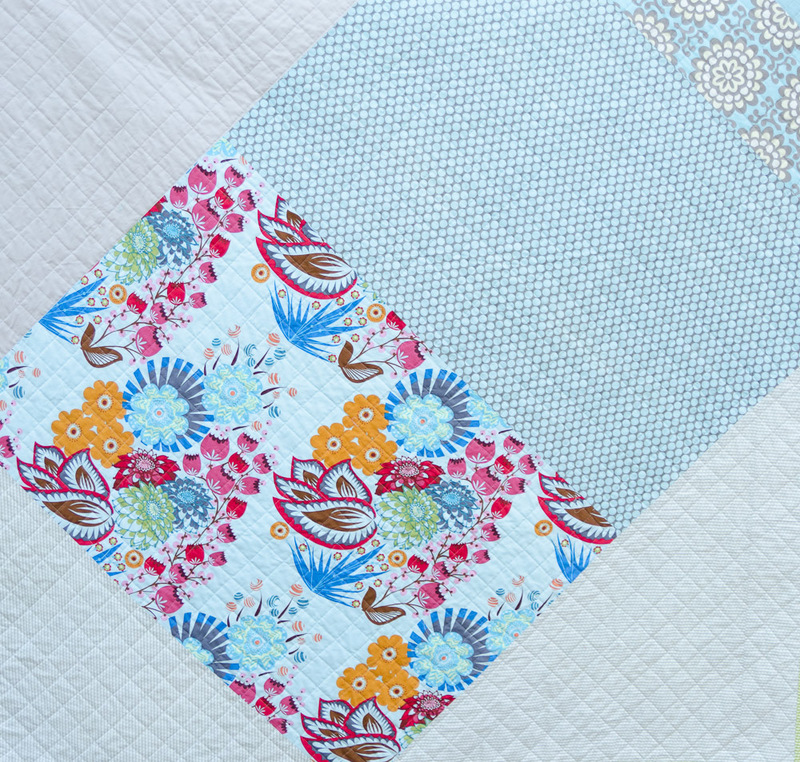 Enough about the back - the front of the quilt is from a design by Jessica of A Blue Sky Kind of Life. You can find the free block tutorial here. It's a simple String Block and although Jessica sews her strips to a foundation paper, I simply sewed my strips together and trimmed the block to 10 1/2" square. I did cut my strips a bit longer than she suggests for some extra wiggle room and eyeballed lining the center of the strips up. 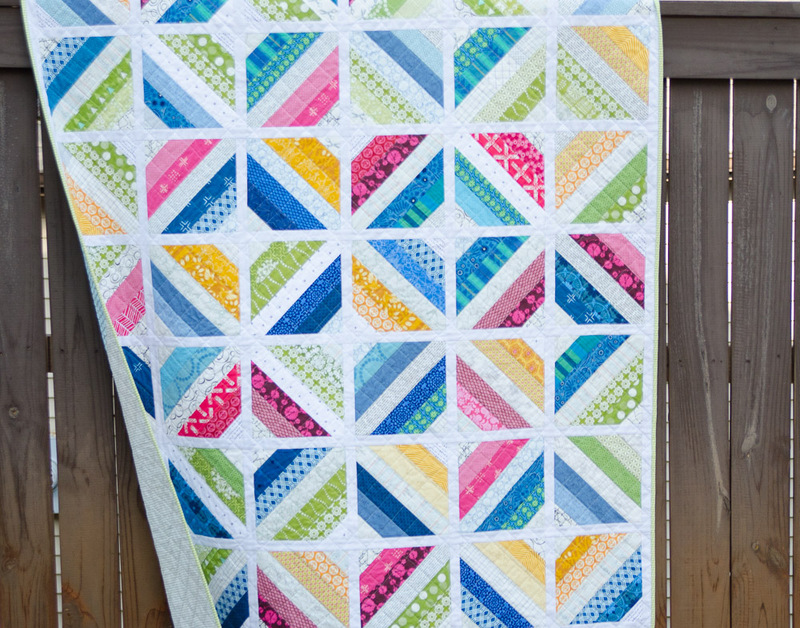 It's such a fun and happy quilt. I used lots of smaller pieces and strips of fabric in my stash including low volumes. I love seeing some of my favorites hanging out together in one quilt. I machine quilted this one with a simple diagonal grid, using my walking foot with guide to space my lines 1 3/4" apart. I have a feeling it will be enjoyed this Summer! It is so beautiful! I love the fabrics, the color placement, and the little bit of sashing that breaks it up a bit and gives the eye a place to rest. So very pretty, bright and joyful! Lovely pattern and color placement. 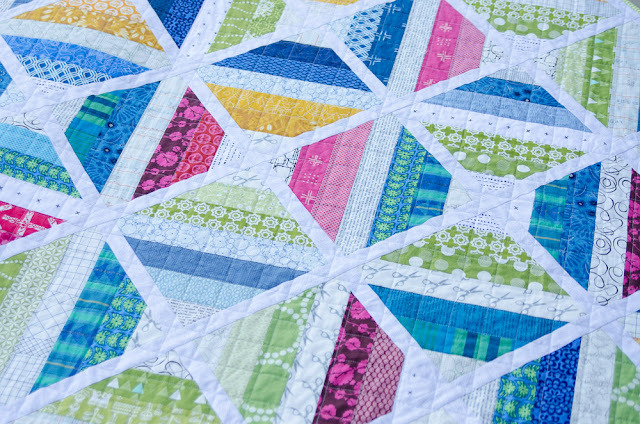 The quilting accentuates it so nicely! Gosh, that’s pretty! 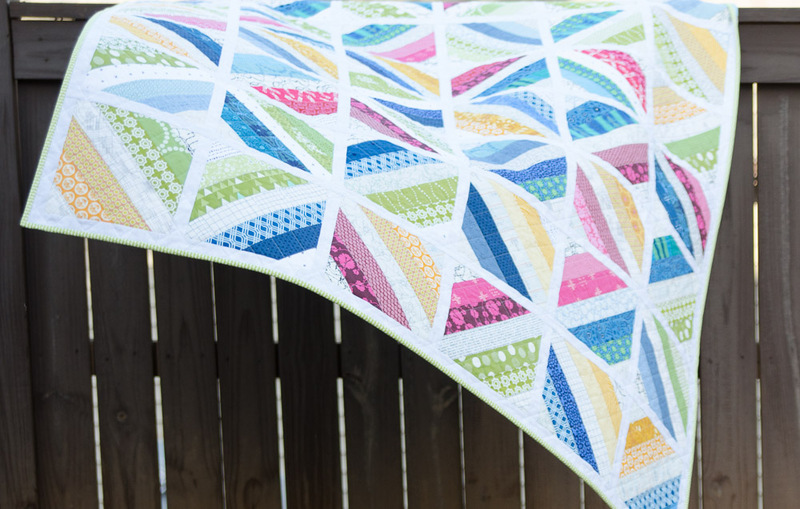 If I wasn’t getting ready to migrate, I’d start digging through my scraps right this minute and make one, too! OooooH! I love your colors! with the white background it looks so fresh and crisp!! Perfect for summer! I also appreciate you sharing the back of your quilt, too. Did you use fat quarters for the backing? Beautiful job! 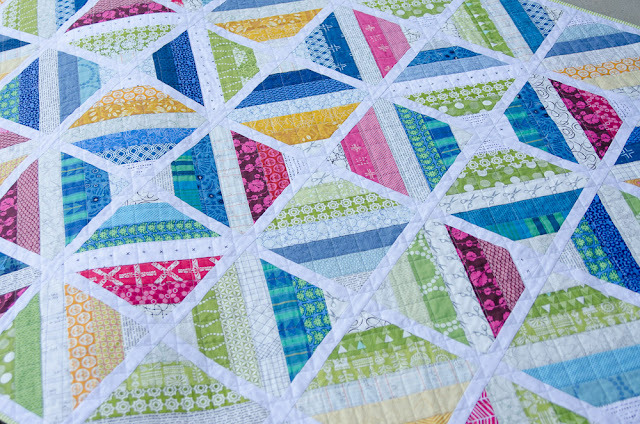 That is a beautiful summer quilt - fresh and crisp! 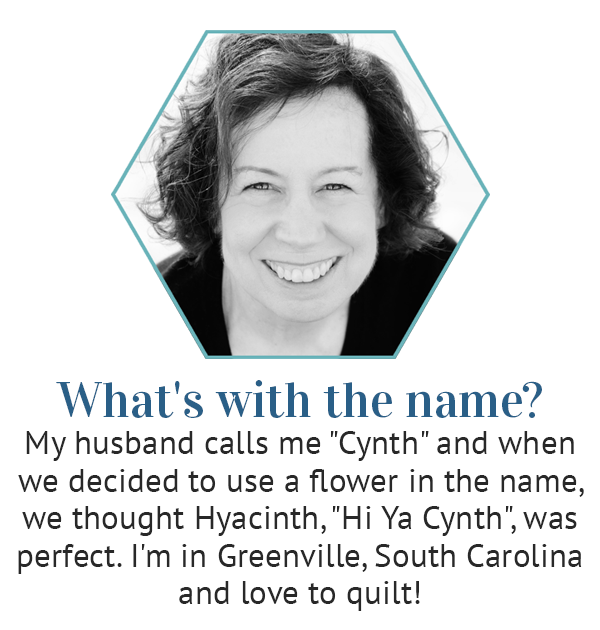 Beautiful, Cindy! And I love that the LV backgrounds are so subtle. Love it! Will definitely try this one with my years of accumulated "stash"!